Free Shipping Included! Arlo Pro by NETGEAR Security System with Siren - 2 Rechargeable Wire-Free HD Cameras with Audio, Indoor/Outdoor, Night Vision (VMS4230), Works with Alexa by NETGEAR at N Online Agency. MPN: VMS4230-100NAS. Hurry! Limited time offer. Offer valid only while supplies last. 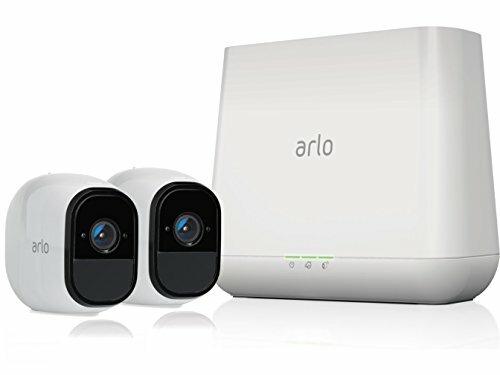 Arlo Pro is a 100% wire-free indoor/outdoor security camera with rechargeable batteries and audio and can be added to any Arlo base station system. Arlo Pro is a 100% wire-free indoor/outdoor security camera with rechargeable batteries and audio and can be added to any Arlo base station system. Arlo Pro includes rechargeable batteries, motion and sound-activated alerts, 2-way audio, a 100+ decibel siren, and 7 days of free cloud HD video recordings. Arlo covers every angle to help keep you safe and protected.Note: Place the camera within the WiFi's range for the device to work effectively.